For the first time since 2005, the Central Information Commission (CIC) has reported a 6% dip in the number of Right to Information (RTI) applications received by the Central Government. 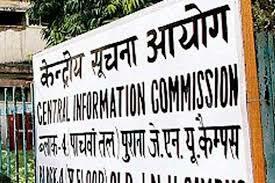 A preliminary review of the statistics in the Annual Report of the CIC for the year 2016-17 has revealed that the number of RTI applications has come down from 9.76 lakh in 2015-16 to 9.17 lakh. Bringing this to light, an email alert from Venkatesh Nayak, senior activist with the top advocacy group, Commonwealth Human Rights Initiative (CHRI), has reported that the overall proportion of rejection for the Central Government has come down only marginally from 6.62% in 2015-16 to 6.59% in 2016-17. Nayak in his analysis says, the Ministry of Finance has "once again topped the list of Ministries with the most number of RTI applications received in a year, thanks to the inclusion of RTI data from banks, insurance companies and the income tax authorities", even though "there is a 2.65% dip in the number of RTI applications filed in 2016-17 as compared with the previous reporting year." He adds, "175 public authorities under this Ministry received 1.51 lakh RTI applications as against 1.55 lakh RTI applications received the previous year. The proportion of rejection has also gone up marginally from 18.30% in 2015-16 to 18.40% in 2016-17." Pointing out that the Prime Minister's Office received "almost 13% more RTI applications in 2016-17 as compared to the previous year", Nayak says, "In 2016-17 PMO received 12,787 RTI applications as compared with 11,138 in 2015-16. Interestingly, the proportion of rejection has fallen to 10.21% in 2016-17 as compared with 20.10% in 2015-16." As for the Ministry of Home Affairs, Nayak says, it has "reported a 3.62% rise in the number of RTI applications received in 2016-17", adding, "28 public authorities under the Home Ministry received 59,828 RTI applications this year even though 33 public authorities reported 57,657 RTI applications the previous year." He adds, "The proportion of rejection has gone up considerably to 16.10% in 2016-17 from the 14% figure reported in 2015-16. A bulk of these RTIs (6,422) were rejected by the exempt organisations under this Ministry such as Assam Rifles, Border Security Force, Central Industrial Security Force, Sashastra Seema Bal etc." "The Ministry of External Affairs reported13.37% in the number of RTI applications received in 2016-17 although the number of public authorities under this Ministry has gone up from four in 2015-16 to 101 in 2016-17 with the recognition of all Embassies and High Commissions as public authorities in their own right", Nayak says, adding, "Interestingly, the proportion of rejection of RTIs in 2016-17 has fallen to 0.6% as compared to 5.74% in 2015-17." He further says,"The Ministry of Defence reported a backlog of 89,391 RTI applications at the beginning of 2016-17 which is 39% of the bulk of RTI applications it had to deal with during the year. Only 58,339 fresh RTIs were received this year", adding, "This is an increase of 14.36% over the receipts in 2015-16. The proportion of rejection has fallen considerably to 6.80% in 2016-17 from 11.50% in 2015-16." Giving a breakup, Nayak reports, "More than 97.5% of the backlog of RTI applications in the Defence Ministry were actually reported by the Indian Army -- 87,167 pending at the beginning of 2016-17. During the Army received 17,599 RTIs -- a 2% increase over the figures reported in 2015-16. The proportion of rejection has fallen to 5.50% in 2016-17 from 8.9% the previous year." He adds, "The Indian Air Force did not have any backlog at the beginning of 2016-17 and received 3,947 RTIs during the year. The proportion of rejection has also fallen considerably to 17.50% from 36.30% reported in 2015-16. The Indian Navy received 1,645 RTIs in 2016-17 which is more than double (almost 55%) the number received in 2015-16. However, the proportion of rejection has fallen to 12.90% as compared to 18.50% during the previous year." Nayak notes, "The Ministry of Personnel, Public Grievances and Pensions, the nodal Ministry for implementing the RTI Act in the Central Government, received 3% more RTI applications in 2016-17. However, the proportion of rejections has jumped to 5.76% from 3.4% reported in 2015-16." Analysing the data of the higher judiciary, Nayak notes, "The Supreme Court of India received 3.8% more RTIs in 2016-17. However the Apex Court rejected a quarter of these RTIs (25.5%). In 2015-16, the Court had rejected only a fourth of the RTIs received (21.1%)." He adds, "The Delhi High Court received 12.18% more RTIs in 2016-17 as compared with the previous year. Interestingly, the proportion of rejection has fallen to 23.7% from 27.3% in 2015-16." This is in reference to the news report that there has been 6% dip in RTI applications in 2016-17 as per Chief Information Commissioner (TOI dated 17-1-2018). It will not be a surprise if the percentage dips even further in the coming years. Only the seasoned RTI applicant can file his application successfully and get it numbered at the first instant; he may or may not get the required information. An ordinary citizen will find it cumbersome to get the information required to file his application. A Government of India Circular which is available in the website very clearly states that the cheque or demand draft for the application fee should be drawn in the name of Account Officer followed by the name of the authority and this circular was sent to all the Chief Secretaries of the State Government and all departments of the Central government. The circular goes on to instruct the officers to open bank account in the name of Account Officer of the concerned authority if not already opened. The RTI Act says that the Application can be on a plain paper and it is not mandatory for any particular application form. When a simple person (not the RTI Activists, lawyers and print and electronic media) sends his RTI application, it is very rarely accepted at the first instant. The Application will be returned finding fault with the name in which the cheque/demand draft are drawn and on another reason that the application is not in the format given by the particular authority. To simply return the application on some flimsy reasons itself takes anywhere between two to three months. This is done to frustrate the ordinary applicant. The Chief Information Officer of a particular authority to whom the applications are sent is drawn from the same authority and naturally he will try to shield his own department’s officers from inconvenient questions. Unless a Committee consisting of persons from public life is formed under whom the Chief Information Officer of such authority functions an ordinary citizen will have to move heaven and earth to elicit the required information provided he is very persistent in his efforts.